He who is not contented with what he has, would not be contented with what he would like to have, because as the saying goes earth provides enough to satisfy every man`s needs, but not every man`s greed. 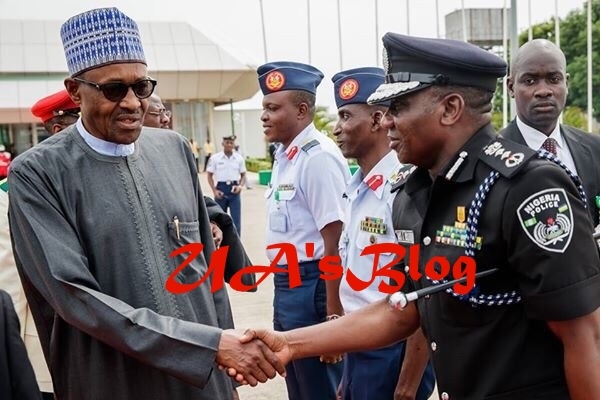 The Inspector General of Police Idris Abubakar is set to measure height with Generals in the military as he seeks to become equal with a Lt. General in the Nigeria Army. This is the driving force behind the recent struggle for the remuneration of the Nigeria Police which led to the submission of a white paper by a committee constituted by the presidency placing the salary and rank of the Inspector general of police as being equal to that of a Lieutenant General in the army. Documents in possession of SecretReporters reveals that the recommendation by the committee which got the approval of the Chief of Staff to the President and forwarded to the National Salaries, Income and Wages Commission through the office of the president showed the amendment of the IGP`s salary is now in tandem with that of a Lieutenant General. The recommendation we learnt will be implemented in November 2018. Over the years, the Nigeria Police had advocated for the increase of its remuneration and salaries as it claimed that initially, its grading structure was the same with that of the State Security Service (SSS) which at inception had a Director benchmarked with a Commissioner of Police unlike what is obtainable currently where an SSS Director is equivalent to an Assistant Inspector General of Police. Furthermore, the IGP who has never lost sleep over the matter with many Top ranking officers in the Nigerian Police are of the view that in terms of span of control and responsibility of personnel, the Director in SSS on grade level 17 who is in charge of one state should have been benchmarked with a Commissioner of Police who is also in charge of one state instead of an Assistant Inspector General of Police who is in charge of at least three states. It should be noted that the newly approved remuneration if included in the 2019 budget, will increase the budget by more than six billion Naira.